The Pimsleur® Method: the easiest, fastest way to learn a new language. Completely portable, easily downloadable, and lots of fun. You’ll be speaking and understanding in no time flat! Each lesson in Pashto Phase 1, Units 1-5 provides 30 minutes of spoken language practice, with an introductory conversation, and new vocabulary and structures. Detailed instructions enable you to understand and participate in the conversation. This course teaches the Northern dialect, as spoken in Kabul and Jalal Abad (Afghanistan) and in the Northwest Frontier Province (Pakistan), which will be understood through all Pashto-speaking regions. Each lesson contains practice for vocabulary introduced in previous lessons. The emphasis is on pronunciation and comprehension, and on learning to speak Pashto. 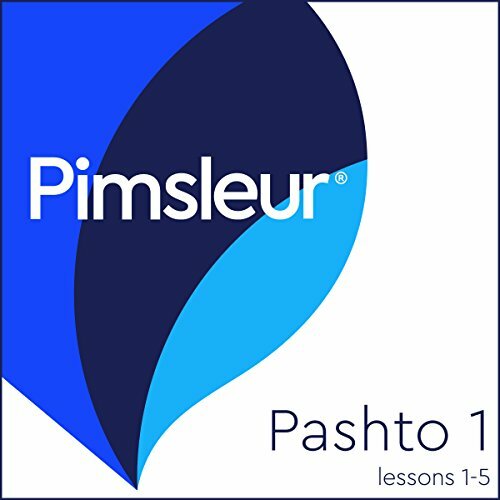 Each lesson in Pashto Phase 1, Units 1-5 provides 30 minutes of spoken language practice, with an introductory conversation, and new vocabulary and structures. Detailed instructions enable you to understand and participate in the conversation. This course teaches the Northern dialect, as spoken in Kabul and Jalal Abad (Afghanistan) and in the Northwest Frontier Province (Pakistan), which will be understood through all Pashto-speaking regions. Excelente método para aprender un nuevo idioma. Pashto Phase 1, Units 6-10 build on material taught in prior units. Each lesson provides 30 minutes of spoken language practice, with an introductory conversation, and new vocabulary and structures. Detailed instructions enable you to understand and participate in the conversation. Pashto Phase 1, Units 11-15 build on material taught in prior units. Each lesson provides 30 minutes of spoken language practice, with an introductory conversation, and new vocabulary and structures. Detailed instructions enable you to understand and participate in the conversation. Pashto Phase 1, Units 16-20 build on material taught in prior units. Each lesson provides 30 minutes of spoken language practice, with an introductory conversation, and new vocabulary and structures. Detailed instructions enable you to understand and participate in the conversation. Pashto Phase 1, Units 21-25 build on material taught in prior units. Each lesson provides 30 minutes of spoken language practice, with an introductory conversation, and new vocabulary and structures. Detailed instructions enable you to understand and participate in the conversation. Pashto Phase 1, Units 26-30 build on material taught in prior units. Each lesson provides 30 minutes of spoken language practice, with an introductory conversation, and new vocabulary and structures. Detailed instructions enable you to understand and participate in the conversation. Pashto Phase 2, Units 1-5 build on material taught in prior units. Each lesson provides 30 minutes of spoken language practice, with an introductory conversation, and new vocabulary and structures. Detailed instructions enable you to understand and participate in the conversation. Each lesson contains practice for vocabulary introduced in previous lessons. The emphasis is on pronunciation and comprehension, and on learning to speak Pashto. Pashto Phase 2, Units 6-10 build on material taught in prior units. Each lesson provides 30 minutes of spoken language practice, with an introductory conversation, and new vocabulary and structures. Detailed instructions enable you to understand and participate in the conversation. Each lesson contains practice for vocabulary introduced in previous lessons. The emphasis is on pronunciation and comprehension, and on learning to speak Pashto. Pashto Phase 2, Units 11-15 build on material taught in prior units. Each lesson provides 30 minutes of spoken language practice, with an introductory conversation, and new vocabulary and structures. Detailed instructions enable you to understand and participate in the conversation. Each lesson contains practice for vocabulary introduced in previous lessons. The emphasis is on pronunciation and comprehension, and on learning to speak Pashto. Pashto Phase 2, Units 16-20 build on material taught in prior units. Each lesson provides 30 minutes of spoken language practice, with an introductory conversation, and new vocabulary and structures. Detailed instructions enable you to understand and participate in the conversation. Each lesson contains practice for vocabulary introduced in previous lessons. The emphasis is on pronunciation and comprehension, and on learning to speak Pashto. Pashto Phase 2, Units 21-25 build on material taught in prior units. Each lesson provides 30 minutes of spoken language practice, with an introductory conversation, and new vocabulary and structures. Detailed instructions enable you to understand and participate in the conversation. Each lesson contains practice for vocabulary introduced in previous lessons. The emphasis is on pronunciation and comprehension, and on learning to speak Pashto. Pashto Phase 2, Units 26-30 build on material taught in prior units. Each lesson provides 30 minutes of spoken language practice, with an introductory conversation, and new vocabulary and structures. Detailed instructions enable you to understand and participate in the conversation. Each lesson contains practice for vocabulary introduced in previous lessons. The emphasis is on pronunciation and comprehension, and on learning to speak Pashto.